What many people don’t know, is that we also have extensive experience assisting food and beverage manufacturers. In fact, Our Good Manufacturing Practices (GMPs) and our American Institute of Baking (AIB) Superior Certification set us apart from our competition, allowing us to tackle your toughest challenges, no matter the order size or type of foodstuff you’re working with. Unique adhesives & custom coatings: Does your product require temperature control? Will it require extended transport from the manufacturing facility to the grocery store? No matter your challenges, we have FDA-approved solutions for direct food contact, liquid submersion, and more. Custom die cutting: Our custom die cutting services can make your labels more attractive and informative. We’ll work with you to ensure your brand’s story, manufacturing information, and ingredients are all listed and easy-to-read. Advanced label-printing technology: 21st Century consumers want bright, appealing colors and eye-catching branding. Our goal is to bring your vision to life. 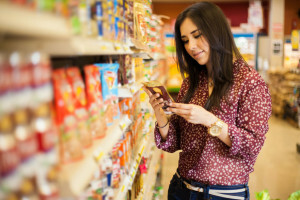 Whether you’re a new brand just starting out or are well-established brand in need of reinvention, our food and beverage labeling experts can help. Call us today to request a consultation! 616-459-8134.